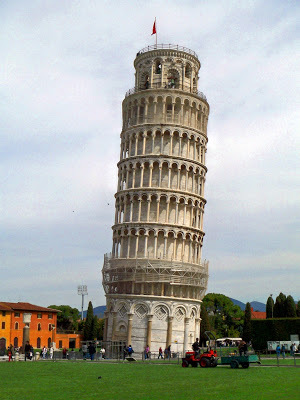 It’s interesting to think that without a rather dramatic flaw in engineering, Pisa wouldn’t be nearly the tourist center that it is. 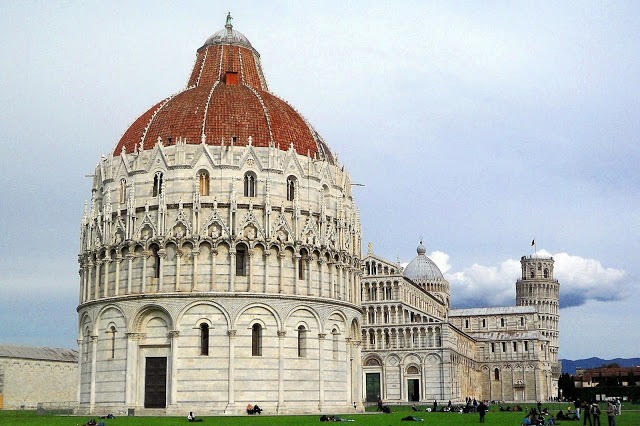 Nevertheless, Pisa is one of those places you almost feel like you have to visit, especially when you’re only 45 minutes away in Florence. The attractions in Pisa are concentrated within a few square blocks, easy to see and definitely worth a couple of hours of time. The Campo dei Miracoli (Square of Miracles), or Piazza del Duomo if you’re not a tourist, is an easy 30 minute walk or 7 minute bus ride from the train station. Since I had injured my ankle pretty badly a few days earlier in Rome, I opted for the bus (LAM Rossa, which is just across the street from the train station). The bus takes you right to the main attractions flanked by numerous souvenir stands. Thanks to Rick Steves, I quickly found a nearby trattoria called La Buca and grabbed a quick pizza made with fresh mozzarella di buffala. It was a little high priced for what I got, but the view of the tower from the patio and the tasty bread made it worth it. 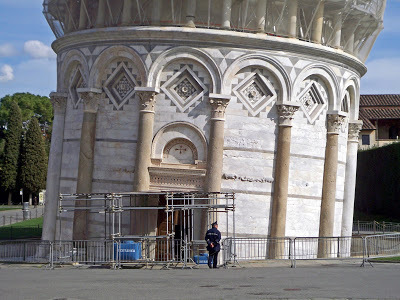 There are three sites in the piazza – the Baptistry, the Duomo and, of course, the (leaning) Belltower. I skipped the Baptistry but did pony up a few euros to tour the Duomo, which was an excellent decision. The Duomo has a number of remarkable elements. Most guide books focus on the pulpit that was carved by Giovanni Pisano, which is considered a masterpiece of medieval sculpture. 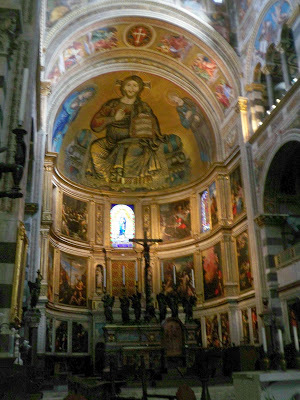 It’s quite impressive, but, for me, paled in comparison to the amazing mosaic, Christ in Majesty, above the altar. Also interesting was the tomb of the Holy Roman Emperor Henry VII. Esthetically, it looked like most other tombs, but it was a Holy Roman Emperor, come on. Then there’s the tower. Even with as many pictures as I’ve seen of it, it was still an interesting site in person. Strangely, I was surprised to see that the closer I got to it, the less it appeared to lean. I wasn’t sure how the photos were going to turn out, so I took one just of the first floor to illustrate how crooked it really is. According to the information outside the tower, so much work has been done in recent years that the tower is now probably the most stable it’s been since construction started over 800 years ago.